Since 1997, Schouten Zekerheid is established in the Schouten Tower at the foot of the Brienenoordbrug. Every day, about 250,000 motorists drive along "our" tower, which is situated near the A16 on the Rivium Business Park. Our office building, designed by Aat van Tilburg, is inspired by the classic American skyscraper shape, with constrictions that define the silhouette. The building has 18 layers, and its height (including the crown) is 81 metres. The heart of the tower has two lifts, stairwells and restrooms. There is also a glass lift on the exterior. This lift grants a view of one of the busiest roads of the Netherlands, the rivers, the Erasmus University, the silhouette of Rotterdam, and even The Hague when the weather allows. The tower grants a 360 degree view of Rotterdam on every floor. On this page, you will find a video in which we gladly share our unique view. Do you want to experience this view for real? Please contact us, so we can welcome you into our office! From 25 March onwards, "our" tower can also be seen in MiniWorld Rotterdam. 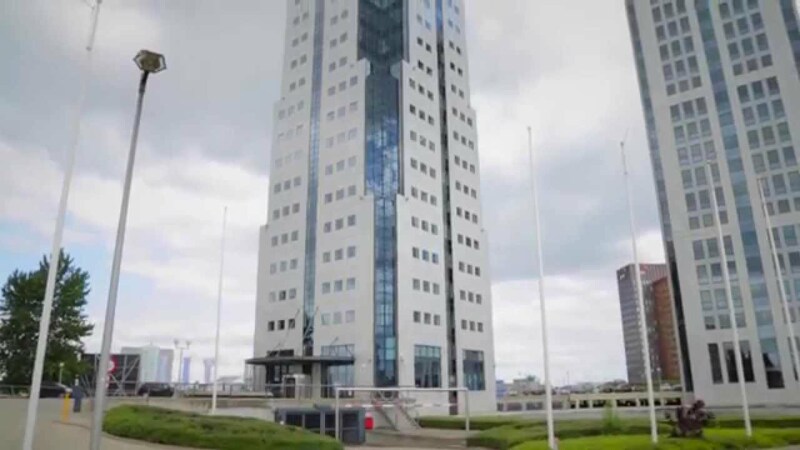 Our large, small tower can be seen next to landmarks such as the Erasmus Bridge, the Kuip and the Euromast.